I’m not much good at facts and figures, statistics and predictions. When people at a party start having “future of the book” conversations I usually just blurt out a few Richard Nash quotes, and then head for the appetizer table. But this article in the WSJ today about how PRINT IS HERE TO STAY is interesting to me. And here is where I stand: I SIMPLY LOVE PAPER BOOKS. This is not an opinion about technology or the environment, nor is it an academic argument about literature and literacy, the modes in which we consume information. I suppose, on some level, it’s a knee-jerk response, rooted in nostalgia. I’m getting older, and I don’t like how fast things are changing. I don’t use a smart phone. I hate to text. I spent five weeks road-tripping with my kids this summer, and didn’t have a DVD player or ipad for them to stare at, and we didn’t use a GPS. Instead they learned to read a map. So yeah, I’m an old fashioned girl. But it’s not just nostalgia, my position. I really believe that books are a perfect technology. I believe that simplicity can often be more functional than complexity. Books are just… perfect. Crappy broken-spined paperbacks or gorgeous new hardcovers? All of them! Books serve so many purposes in my life. They’re easy to loan to a friend. It’s a snap to make notes in the margins. They serve as great coasters on a coffee table. They decorate walls like nothing else. Strolling around a house for the first time, I can learn so much the owner from the books that clutter their shelves. I open my old stained JOY of Cooking, and out flutter notes from my grandmother, amending the recipes. I’ve collaged the art from books that couldn’t be saved, to make cards and gifts and to decorate cigar boxes, and in one case, a set of chairs! I’ve framed particularly amazing color plates from old picture books that had fallen apart, to decorate my walls. I’ve found old books in houses I moved into, full of ephemera from ages gone by, and spent years trying to piece together the mystery of the original owner. In used bookstores, I’ve stumbled on hilarious inscriptions from the author, that unlocked secrets about the poems I was about to read. Books are perfect for the bath! When you fall asleep reading you don’t run down a battery. Paper books don’t contribute to my insomnia (which there is some indication that reading screens before bed will do). I can go on and on, forever pretty much. The uses and reasons to love a book are infinite. But the biggest one? The biggest one is that I believe in BROWSING. And in a world of digital books, browsing all but disappears. I’m not talking about searching for a title. I’m not talking about the informed suggestions Amazon or Goodreads will make for you, based on your past reading patterns. I’m also not talking about a totally random shuffle. I’m talking about something in-between. A mixture of intent and randomness. Of staring at a shelf (in a bookstore or a library or at home, it doesn’t matter) of books, colors, spines, widths and heights and fonts. It’s a tactile process. Some of them books I’ve read and some I’ve never heard of and some I’ve been meaning to get to. I stand there, and run my fingers along the spines. I stand on tiptoe to see the top shelf. I sit on the floor to see the bottom shelf. ANd at some point, I have an AHA! moment. I realize that the very perfect book for me to read at that moment in time is THIS ONE. So I pull it from the shelf, and fall in. Sometimes it’s a random book I would never ever read otherwise (this is how I found KING RAT as a teen, and the thought of it still gives me shivers). Sometimes it’s a book I’ve attempted to read before, and not been able to penetrate, only THIS time I’m a little older, or the weather is right, and the book becomes a favorite (ANGLE OF REPOSE happened for me this way). Sometimes it’s a book I already love, but I wasn’t thinking about it, until suddenly I saw the cover and KNEW it was the perfect moment for a reread (I’ve revisited BRIDESHEAD about 10 times this way). The point is that I wouldn’t have that experience with an ereader. I wouldn’t BROWSE. And I can’t overstate how much that experience matters to me. There is something magical about the process– an alchemy of me being ultimately in control of what I read, but also giving myself up to the randomness of the shelves, the fact that there are lots of things I’ve never heard of. The willingness to be surprised, and stumble into something new. Because the cover is a lovely shade of blue, or because someone mentioned it just last week. I’ve already had this issue with music. I forget so much of what’s saved in our digital system, that I gave up on it and reverted to a small cluttered stack of CDs on a kitchen shelf, because I like the visual reminder of what my options are… I don’t want a shuffle, but I also don’t want to have to SEARCH for something. Because I never seem to know what I want until I spot it. Imagine this process in a restaurant, can you? Imagine if menus were digital and options unlimited. Imagine if you lost that experience of sitting down with a menu, encountering new foods and descriptions. Imagine if your only choices were either to have the waiter SURPRISE you, or to have to describe exactly what you wanted to eat. I’d find the world less magical, less interesting, less surprising… and I’d end up eating the same things over and over, or I’d end up with dishes I absolutely hated. Now, I’m not in a position to assume I know how YOU eat or read, or what your relationship to browsing is. And maybe you have plenty of coasters, and aren’t an insomniac. Maybe books on screens make sense for you. I only know that they don’t for me. And as a parent, I know that the pile of books my kids rifle through daily, on the floor of the car, are a joy to see. 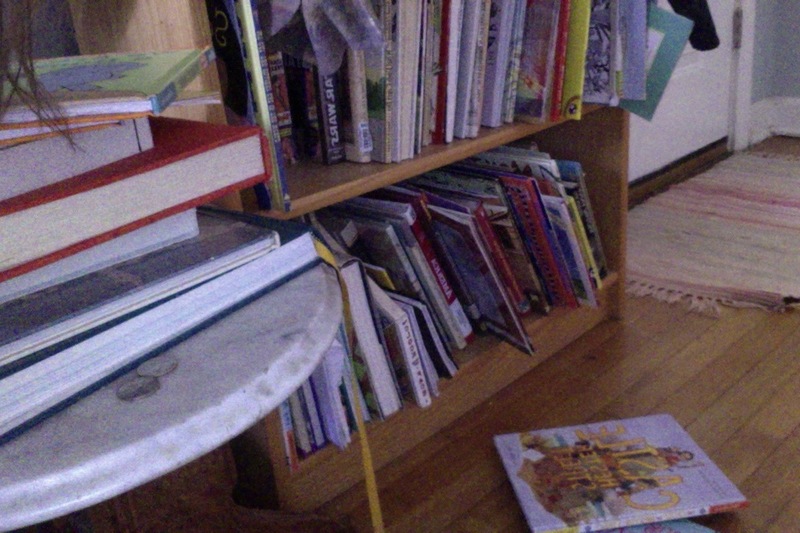 And when Mose and Lew spend hours (HOURS, no lie) each day, staring at the pages of the books I grew up with, engrossed, in love… and then I come in and find half the books pulled from their shelves, my heart swells. Because I know my kids love to browse too. And for me, that’s the future of books. This entry was posted on Saturday, January 5th, 2013 at 9:57 am	and is filed under Blog. You can follow any responses to this entry through the RSS 2.0 feed. You can leave a response, or trackback from your own site. I’ve read a lot of such efforts as this, Laurel. Yours is the best. And thanks for not mentioning that you love the way books smell. I don’t especially, love the way they smell. I’m always surprised when I meet people who think ebooks will cause print books to die out. They’re different products. Ebooks have their advantages, but print books also offer things that ebooks can’t. As just one example, ebooks are often praised for being easier on travel (and in some ways, they are), but whenever I fly I notice that everyone around me has to turn off their ereaders for 10-20 minutes for take off and landing while I continue reading my print book during that time. My point is that I think ebooks took off sharply because everyone who preferred that media snatched them up (and there’s just the allure of something new), but then I expect sales will start to stabilize with people buying ebooks and/or print depending on their specific preferences and needs.